Outdoor theatre, built 1951-1952 by Smith, Carter and Katelnikoff. Opened 22 Sep 1953 with a concert by the Kitsilano Boys Band. 1970 addition of a triodetic dome roof. 1986 renvations. 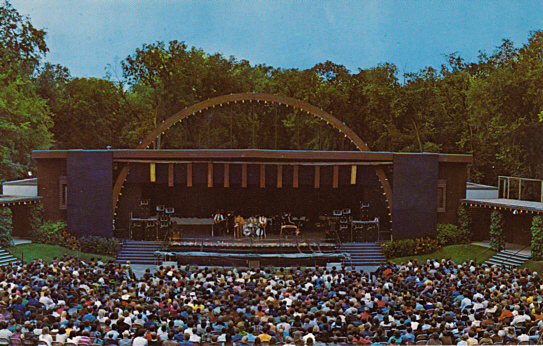 Reverse Text: "Rainbow Stage - Kildonan Park, Winnipeg, Canada. In its beautiful setting amongst the trees Rainbow Stage is the scene of popular musical and dramatic productions during the summer months. Kildonan Park is operated by the Parks and Protection Division of the Metropolitan Corporation of Greater Winnipeg." Reverse Text: "Winnipeg, Manitoba, Rainbow Stage. 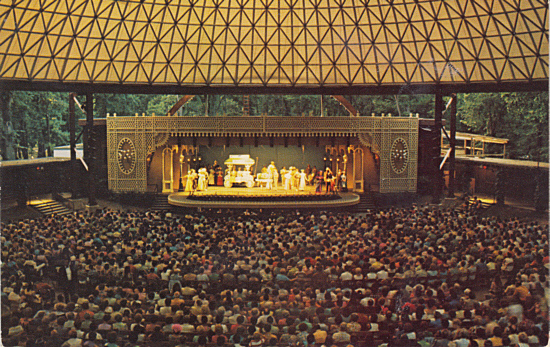 Under the beautiful dome of Rainbow Stage, residents and visitors are treated to spectacular stage productions each year." 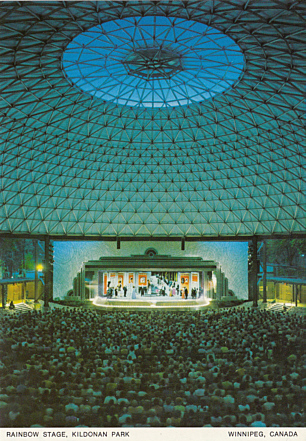 Front Text: "Rainbow Stage, Kildonan Park - Winnipeg, Canada"
Reverse Text: "Nestled amongst the trees of Kildonan Park and protected from rain by its 166 ft. diameter dome, Rainbow Stage is Canada's only major outdoor theatre. Its highly professional productions have included Broadway musicals, comedies and dramas featuring international artists. - Niché dans les bois du parc Kildonan, et protégé contre les éléments par un Dôme de 166 pieds de diamètre, le Rainbow Stage est le seul théâtre important en plein air au Canada. Inclus parmi les mises en scènes très professionelles se trouvent des pièces musicales, des comédies et des drames, mettant en scène des vedettes internationales."